The Festival of Passover and Unleavened Bread along with the Festival of Shabuath (Pentecost) were not just Jewish concerns. Today, few English-speaking Christians, largely due to their long practice of glossing the Hebrew word Phasekh (Passover) with the name Easter and their abandonment of the Festival of Pentecost, realize that Passover and Pentecost were the chief religious observances of the early Christian assemblies. In one form or another, all early Christian groups not only observed the Passover and Pentecost but calculated the Passover observance in connection with the seven days of Unleavened Bread. the Aristocratic method, counting from the first day of the week following Abib 14. The Passover was another matter. Unfortunately, as had occurred with the Jewish experience, divergent opinions about the Passover soon sprang up. One fact is certainly cogent. Since the messiah never sinned, the Passover observed by the messiah and his disciples provides an important key to the correct Passover celebration. In this regard, all the various early assemblies made the claim that they were continuing the Passover, either in fact or in spirit, as the messiah had commanded. Yet, only one of these practices, if any, can be correct. Therefore, in our search for the original and true observance of Passover and the seven days of Unleavened Bread, it is incumbent upon us to fully examine these various early Christian systems in order that we might ultimately weigh their credibility and worth against Scriptures. Few Christians today realize the vibrant and rich history that has been preserved for us from the Ante-Nicaean Christian period (30-324 C.E.) and afterward. Contrary to the popular opinion of a Christian “dark age,” what we actually find is a time of great debate, turmoil, and doctrinal evolution. As we search through the ancient records from this period, we discover that during the first several centuries of our common era four basic Passover systems, with some local variations, were competing with each other for the hearts and minds of the numerous Christian assemblies. Buried in the pages of antiquity is the little known fact that the original Passover practice of the early Christian assemblies was the Aristocratic System A. We retain the System A label due to the fact that the original Quartodeciman practice was a direct descendant of the old conservative Zadok (Tsadoq) system of the priests. For that reason, those who followed this system, or one of its later variants, were subsequently called Quartodecimans (14th keepers). The Quartodeciman formula was nothing less than a continuation of the Aristocratic understanding: the 14th was Passover and the seven days of Unleavened Bread continued from the 14th until the end of the 20th of Abib (the first lunar month). The early Quartodecimans differed from the old Jewish Aristocratic system in that they did not practice the ritualistic sacrifices or offerings of the handwritten Torah, including the slaughter of the Passover lamb. In its place, they counted the messiah as the true Passover lamb and his death as a realization of the prophetic type expressed in the handwritten Torah and sacrificed and eaten on the night of Abib 14 during the Exodus. Unleavened bread and the mystery of the Eucharist became the focus of this new Christian Passover repast. 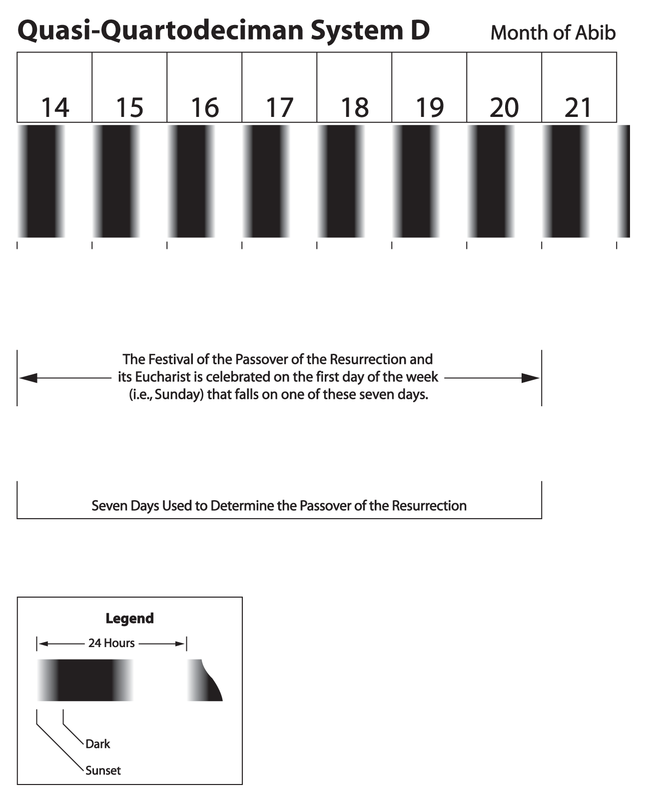 Nevertheless, the method for determining the dates for the Passover dinner and the seven days of Unleavened Bread was identical to that used by the conservative priests (System A). The Quartodecimans noted that the “Passover of the Jews”—a reference to the Passover repast on the 15th of Abib as practiced by the state religion of the Pharisees—was not the true Passover of the Torah. • The 14th was a high Sabbath. • It was a day of remembrance of the messiah’s (the lamb’s) death. • It was the day of the Passover meal (the Last Supper). • It was the day of the fellowship of the Passover Eucharist. The Quartodecimans always celebrated the Passover festival (i.e., the Passover supper and the Eucharist) on the 14th of Abib, regardless of which day of the week it fell on. Also for the early Quartodecimans, the 14th and 20th were always observed as high Sabbaths. During the first three centuries C.E., support was very strong among the early Christian assemblies in the East for the Quartodeciman method, especially in Asia Minor where the apostles John and Philip taught. Nevertheless, after this system was condemned by the Council of Nicaea in 325 C.E. as Judaizing, it was suppressed and soon faded into disuse. In the early second century C.E., along with the collapse of the power of the circumcised Christian bishops of Jerusalem, a dissenting opinion appeared among some of the western assemblies. As a result, a variation of the Quartodeciman view was constructed by some of the bishops in the West. 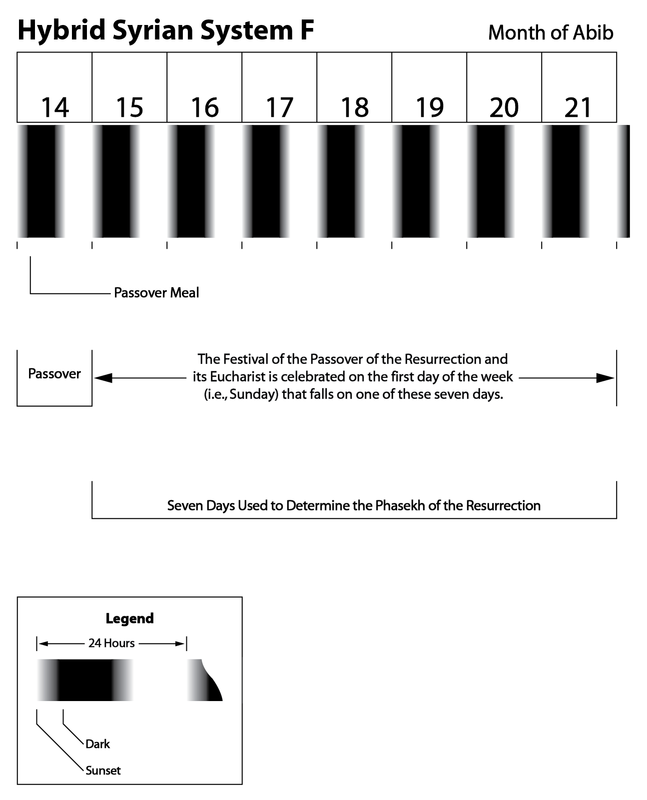 This western quasi-Quartodeciman method (System D)—which must not be confused with other minor quasi-Quartodeciman systems4—retained the Aristocratic under­standing for the seven days of Unleavened Bread, i.e., that these days extended from the beginning of the 14th until the end of the 20th day of the first moon. This system also recognized that the messiah ate the Passover supper on the 14th of Abib. Yet, the advocates of this system did not always keep the Passover supper and Eucharist on the 14th, counting that day as far too sad an occasion for such a joyous celebration. In fact, they considered such an observance an act of Judaizing. In its place, its supporters observed the day of the omer wave offering (emphasized as being the date of the messiah’s resurrection) as the sacred day for the Passover festival and Eucharist celebration. This festival was always placed on the first day of the week within the seven days of Unleavened Bread and, therefore, it would only occasionally fall upon the 14th day. 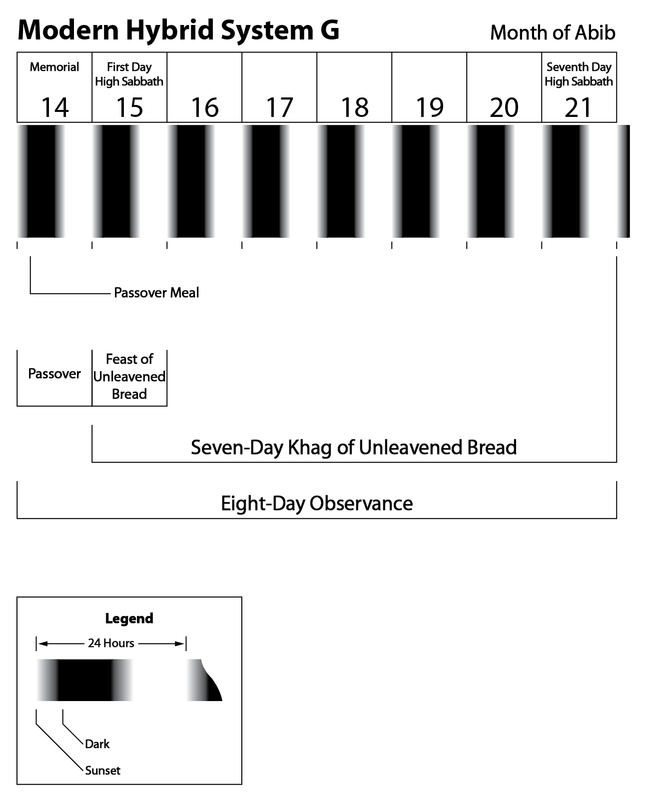 Since the festival of Passover was only observed on the first day of the week within the seven days of Unleavened Bread, the Quartodeciman method of always counting the 14th and 20th of Abib as high Sabbaths was abandoned. This early western quasi-Quartodeciman system became the basis for the first major breach within the early orthodox Christian community. It was originally used in the western districts of the Roman empire, especially in places like Rome and Alexandria, until the latter end of the second century C.E. At that time it was replaced in those districts with the Roman assembly doctrine of Passover (System E). The System D (quasi-Quartodeciman) construct was condemned at the Council of Nicaea (325 C.E.) in the name of unity and under the guise of avoiding any appearance of Judaizing. Nevertheless, System D continued in use for centuries among various outlying assemblies. It was eventually suppressed by the Roman Church, which had slowly gained political power over the other assemblies, and fully disappeared by the early eighth century C.E. In the late second century C.E. a third important construct was developed in the West, chiefly by the bishops governing the assemblies in Rome and Gaul. In the early second century C.E., the assemblies at Rome and Gaul had abandoned System A for System D, regarding the former as an act of Judaizing. Yet, they found it difficult to overcome the Quartodeciman argument that, since the messiah and his disciples had kept their “Last Supper” Passover on the 14th of Abib, all Christians should do likewise. In response to the Quartodeciman position, those in the West took on a new strategy. The western bishops had already found reason to fault the Quartodeciman construct that Passover should be held on the 14th—it was the same day that the Jews sacrificed their Passover lamb and it was the sad occasion of the messiah’s death. The Roman assembly advocates of System E, therefore, believed that if one were to observe the Passover Eucharist5 on this date he was also committing the heinous act of Judaizing. To remove the Quartodeciman claim that the 14th was important, the supporters of System E dismissed the Aristocratic construct altogether and adopted the Hasidic premise, which held that the legal Passover and the seven days of Unleavened Bread began on the 15th of Abib (System E). The 14th, they now argued, was merely the day given under the handwritten Torah for the Passover sacrifice. Indeed, they retorted, since we are no longer under the Torah and since the true lamb has been sacrificed with the death of the messiah on the 14th, that day has been fulfilled. The celebration of the 14th, as a result, is simply no longer necessary or relevant and, to the chagrin of the Quartodecimans and advocates of System D, they proclaimed that the 14th should never be observed as the Passover festival or for the giving of the Passover Eucharist. The advocates of System E then carried over the idea developed in System D that, since the messiah was murdered on the 14th, it was only a commemoration of a sad occasion. The first day of the week (Sunday), on the other hand, being the day of the week of the messiah’s resurrection, was a much happier and more proper day on which to celebrate the Passover. Therefore, the first day of the week falling within the seven days of Unleavened Bread (counting from the 15th until the end of the 21st) should be observed as the festival. 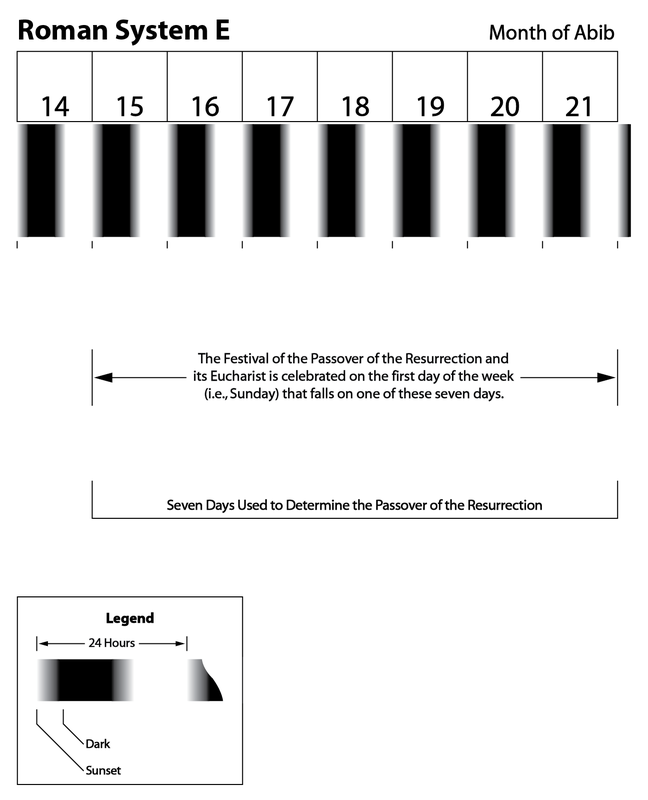 The preceding Friday and Saturday were marked as the day of the messiah’s crucifixion and burial (time in the grave). These days were honored but only as a time to fast, not to celebrate. At the same time, the advocates of System E disregarded the Hasidic interpretation that the 15th and 21st days of Abib were always high Sabbaths. Beginning with Emperor Constantine in the early fourth century C.E., the Roman Church obtained the backing of the Roman empire. It is at this point that the Roman Catholic (Universal) Church truly began. With the Roman government behind them, System E eventually gained the upper hand and overcame all other Christian Passover systems. Though slightly modified over the centuries, this system is presently the dominant practice among Roman Catholic, Eastern Orthodox, and Protestant Christians. The transition to System E proceeded along a different path in Syria. A strong Quartodeciman heritage existed in the East and did not allow for any quick transformation. In response to this reality, those who gravitated toward the western views developed a hybrid system that incorporated both Quartodeciman and western elements. In many ways this hybrid system mimicked the efforts of the Jewish Karaites and the neo-Samaritans (System C), who blended together the Aristocratic and Hasidic constructs to form a hybrid third view (System F). In the late second century C.E., the Syrian assemblies were Quarto­deciman. They kept the 14th day of the first moon as the Passover and their seven days of Unleavened Bread were counted from the 14th until the end of the 20th day of the first moon. Yet, during this same period some of the Syrian Christian assemblies had already adopted the western format of celebrating the day of the resurrection (the first day of the week following the 14th) by keeping the preceding Friday and Saturday as a fast. Major change came after the Council of Nicaea in 325 C.E. The council, dominated by the Roman Emperor, made the decision to disregard any Quartodeciman or quasi-Quartodeciman system for the observance of the Passover festival. They then ordered the various Christian assemblies to adopt the Hasidic construct for the seven days of Unleavened Bread. Unwilling to immediately abandon the 14th as Passover, many Syrian Christians continued to observe the 14th. Yet, to satisfy Rome, some began to attach the Hasidic seven days of Unleavened Bread (from the 15th to the 21st) to their celebration, and like Rome they disregarded the Hasidic idea that the 15th and 21st of Abib were always high Sabbaths. They also continued to keep the Friday and Sabbath preceding Passover Sunday as a fast, though at times this conflicted with the 14th as Passover, and they continued to observe Sunday as the Passover of the resurrection, the messiah being raised on that day. In doing so, they remained in harmony with the Roman Catholic celebration. This hybrid form we have labeled System F.
Once the Hasidic construct for the seven days of Unleavened Bread was fully accepted, it was not long before the hybrid System F construct was, for the most part, abandoned and the Roman Catholic System E Passover completely adopted. In our present time, especially among many Sacred Name groups, a new hybrid has developed. In this form, which we dub System G, the 14th of Abib is the day of the Passover supper, and the 15th is the first day of the Festival of Unleavened Bread. 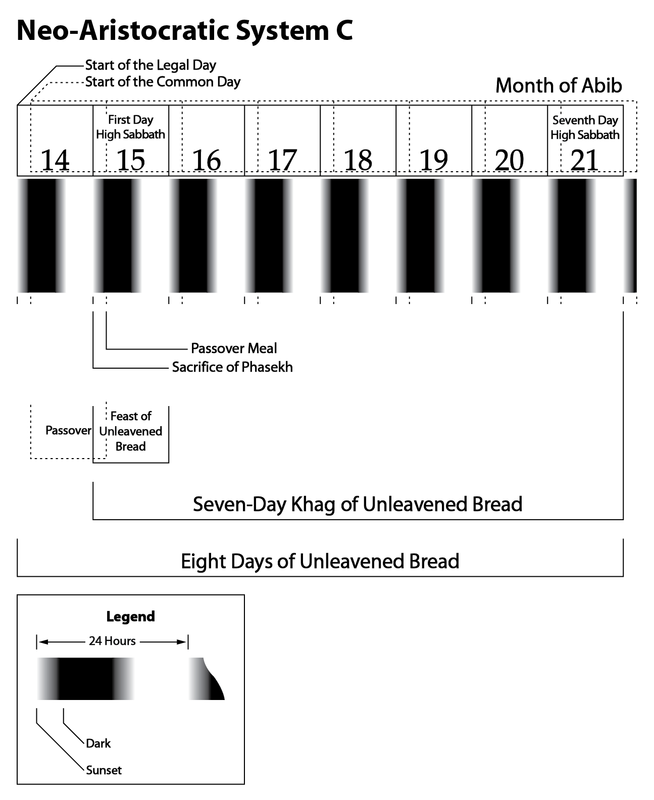 The seven-day Festival of Unleavened Bread extends from the 15th until the end of the 21st day of Abib, a total observance of eight days. Despite the fact that the 14th is also a day of eating unleavened bread, under this system the 14th is not a high Sabbath and is not counted among the seven days of Unleavened Bread. Rather, the 14th is a solemn memorial day in observance of the messiah’s death. At the same time, the Hasidic interpretation that the 15th and 21st days of Abib are high Sabbaths has been retained. Though System G is not explicitly found mentioned among any ancient Jewish or Christian assemblies, its proponents argue that it was the original practice. Minor Views: There are likewise some other minor variant views that have been extrapolated over the centuries. Some believe that arab is merely a point in time. Some claim that the messiah offered his Passover lamb on the 13th of Abib,6 while others believe that some of the rites of Passover, such as the Eucharist, should be offered every Sunday as communion. Such views are either so speculative as to have no substantive support or are so far from the original system that they cannot be remotely considered as celebrating Passover and the seven days of Unleavened Bread. 1 Augustine Epist., 55:17 §32. 2 The Greek term ἐκκλησίᾳ (ekklesia), Latin ecclesia, shall be translated throughout as “Assembly,” if the reference is to the world body, and as “assembly” if the reference is to a local congregation (see GEL 1968, p. 509; SEC Gk. #1577). The Hebrew term behind the Greek and Latin is קהל (qahal), קהלה (qahalah), “an assemblage:—assembly, congregation” (SEC Heb. #6951, 6952; HEL p. 228; cf., CS 1, p. 433). The English term “Church,” which is often used to translate the Greek and Latin words, is misleading in that it gives a connotation of a building for public worship as well as for the congregation. 4 We will address the variant practices of some of these minor quasi-Quartodeciman groups in a forthcoming post dealing with the Quartodecimans. 5 We will use the phrase “Passover Eucharist” when referencing the thanksgiving offered with the bread and wine at Passover. 6 CBTEL 5, pp. 744–746. This entry was posted on 01/28/2013, 2:28 pm and is filed under Calendar, Easter, Feast Days, Passover, Quartodecimans, Religion, Unleavened Bread, Yahweh. You can follow any responses to this entry through RSS 2.0. You can leave a response, or trackback from your own site.